Our goal is to make your time in the Manitowish Waters area the best possible. Have a question on cabin amenities, area recommendations, the Manitowish Chain of 10 Lakes, or really anything else... Contact us! We would love to help. Start by sending us a message through our Make A Reservation page with your desired cabins and dates. We will reply to your message within 24 hours confirming whether the desired cabin + dates are available. Once we confirm the cabin + dates, we'll arrange for a $200 non-refundable deposit to be sent to confirm the reservation. The $200 deposit will be deducted from your balance due. We do not require a separate security deposit. When do you start taking reservations for next year? Reservations can be made up to one year in advance. Our current guests in the cabin have the first chance for the same cabin, the same dates, the following year (i.e. a guest in Lakeview Cabin on May 15, 2017 receives the first chance to stay in the cabin on May 15, 2018). Our return guests have "their week" and have been staying at Alderwood Resort for over 30 years. Want to start a tradition for your family but see that the calendar is full? Send us a message to join our waitlist. When do I pay for the cabin? We like to keep it simple. Once you have mailed us your $200 non-refundable deposit, your cabin is reserved for you. You do not need to send us any payment prior to your arrival. When you arrive to your cabin, you will notice an invoice on the cabin's kitchen table. Before you depart, please put a check or cash in the envelope and you've paid! If you prefer to pay via credit card, call us (715) 892-7374 and we'll stop by. What does the kitchen include? Our kitchens are stocked with all necessary items including full size refrigerators, gas ranges, microwaves, 10-12 cup coffeemakers, toasters, pots & pans, a cast iron pan, baking sheets, muffin pans, ice cube trays, plates + bowls, serving dishes, serving ware, utensils, grilling utensils, coffee cups, water glasses, and wine glasses. Just outside your cabin, we provide a picnic table and charcoal grill. If you notice something is missing from the kitchen or needs to be replaced while you are at Alderwood, contact us and we will replace it as soon as we can. On our cabin property, remember to pack bath + beach towels, food + pantry items, life jackets, personal toiletries, charcoal, and lighter fluid. Staying in The Brick House? Remember to bring beach towels, food + pantry items, life jackets, personal toiletries, charcoal, and lighter fluid. Is a boat included with the cabin? Yes! 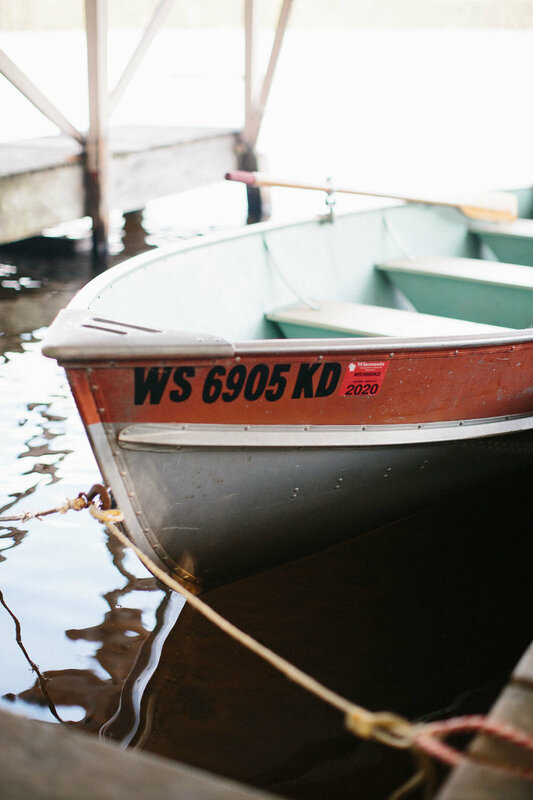 Our cabins include a rowboat + oars come with each rental. The cabins also share a selection of canoes and kayaks. All boats are stored near the beach area. During your stay, feel free to store rowboats at your dock or under the covered boat shelter. Prior to your departure, please return all boats to the beach area for the next guests. The Brick House includes a rowboat + oars for your use. The Brick House does not have access to the resort's cabin property. We suggest renting kayaks through Coontail Sports (they deliver!) or going kayaking through Hawk's Nest Outfitters. In accordance with Wisconsin state law, life jackets are required for each person in canoes, kayaks, and rowboats. We do not provide life jackets for our guests. Please bring your own if you plan to use to do water activities. 1) Wild Rice Lake, located at the end of Townline Road South. This is a free, public boat launch. 2) Greer's Pier Marina, located on Spider Lake. This launch is a fee launch. We recommend renting a ski boat, fishing boat, or pontoon boat through Greer's Pier Marina. Pontoon boats are also available through Northwoods Pontoon Rentals. Kayaks and paddleboards are available for rent through Coontail Sports - delivery available. How about fishing - bait store, fishing reports, guides? The closest bait store is Townline Sports. If you're on the water, Greer's Pier sells bait and fishing supplies. For fishing advice, read the Manitowish Waters Report + Vilas County Fishing Updates. I heard the water is low on the Manitowish Waters Chain of 10 Lakes? Please keep in mind the Manitowish Chain of 10 Lakes, which Alderwood Resort is on, experiences a 3 to 3.5 foot water draw down from October 1st - ice out in spring (approx. April 15th). This means you may not be able to access all lakes on the chain during that time, especially for those boats with larger hulls. Where do I learn about things to do in Manitowish Waters? Hogan's General Store, located about 5 minutes from Alderwood Resort, offers a selection of grocery items. The closest full service grocery store, Trig's Village Market, is located 10-15 minutes from Alderwood Resort in downtown Manitowish Waters. The following policies are in place to protect you and Alderwod Resort's properties. By paying your deposit, guests are considered to be in agreement of the policies listed below. Please review and understand them before sending a deposit as all policies are strictly enforced. Thank you helping us maintain our properties for generations to come. We are a self-service resort and do not have an office on site. The property manager, Becca Bartling, can be reached at (715) 892-7374 or info@alderwood-resort.com. Inquiries will be responded to within 24 hours. Arrival time is after 3 pm and departure time is by 9 am in all our cabins and The Brick House. Please respect times unless a prior arrangement has been made. To confirm a reservation, we require a $200 non-refundable deposits. Please send checks to Alderwood Resort, 13028 Alderwood Lane, Manitowish Waters, WI 54545. Deposits are non-refundable, but may be transferrable within the same season shall the dates of a reservation need to be changed. Night and weekly rates do not include a 10% tax (5.5% Wisconsin State/Local Tax and 4.5% Lodging Tax). We accept cash, check, or credit card. Since most of our guests desire to pay with cash or check, we have not built a credit card fee into our rates. An extra 3% is applied to credit card payments. Alderwood Resort cabins are open mid-April to mid-October, weather dependent. Cabins are rented weekly during peak season, Memorial Day to Labor Day. Cabins have a 2-night minimum during the off-season, April/May and September/October. Please inquire for shorter stays during our peak season. The Brick House is open year around. No smoking is allowed in any of our buildings, including cigars and e-cigs. If you choose to smoke, butts must be disposed of appropriately. For the comfort of our guests, no pets are allowed during the summer months, Memorial Day - Labor Day. In the off-season, pets are ONLY allowed in Beachview Cabin. Prior arrangments are necessary to bring a pet. (1) The handler is responsible for the care and supervision of his or her service animal. If a service animal behaves in an unacceptable way and the person with a disability does not control the animal, Alderwood Resort has the right to ask that the dog be removed. Alderwood Resort also has the right to deny access to a dog that disrupts their business or poses a direct threat to the health and safety of others. For example, if a service dog barks repeatedly or growls, it could be asked to leave. (2) Under the ADA, service animals must be harnessed, leashed, or tethered, unless these devices interfere with the service animal’s work or the individual’s disability prevents using these devices. In that case, the individual must maintain control of the animal through voice, signal, or other effective controls. For the health and safety of all of our guests, service animals are not allowed to wander the property, swim in the beach area, or be left alone in a rental property at any time. (3) If necessary, Alderwood Resort reserves the right to ask the following questions, in compliance with the rights given to businesses by the ADA. We may ask (1) if the dog is a service animal required because of a disability and (2) what work or task has the dog been trained to perform. We want you to have FUN, but please be respectful and refrainfrom being noisy, especially late at night. Fireworks are NOT allowed on the property. Alderwood Resort reserves the right to deny your future reservation with us if you choose to ignore our policies, such as but not limited to, smoking, garbage removal, disrespecting properties, check out instructions, pets, etc. We carry a Lodging Permit with the Vilas County Health Department. Our property is certified annually, including water, fire extinguishers, smoke/CO2 detectors, and housekeeping standards. Your safety is important to us. Please contact the property manager, Becca Bartling, at (715) 892-7374 or info@alderwood-resort.com.